We’re in San Francisco, California, in an underground parking garage of a hotel in Fisherman’s Wharf. It’s busy outside, the countless tourists distracted by the Golden Gate Bridge, Alcatraz, and all the other amusements the City By The Bay offers. 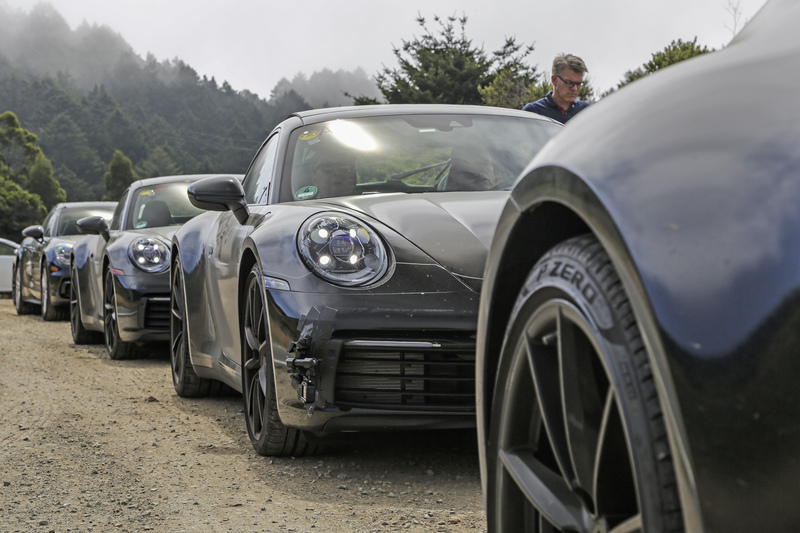 In the garage is a fleet of Porsche’s new 992, along with the odd Cayman and Boxster; Porsche’s engineers are in town, but they’re seeking a different kind of amusement. I’ll be with them for a day of testing, joining a convoy of four Carrera Ss undergoing some final checks prior to the board coming out for a final sign-off drive. Porsche will launch the new 992 with the Carrera S and 4S Coupe in PDK form, with the Carrera and Carrera 4 following in 2019, its introduction also adding manual transmission to the entire line-up. The Cabriolet will join in 2019, while Porsche is also apace with its development of the GT and Turbo models. They’re not discussing those today, the team doing its best to distract attention from the prototype Turbo that’s lurking elsewhere here underground. As-yet-unconfirmed rumours suggest the Turbo S will deliver in excess of 650hp. The world’s gone mad. Back to reality, though, the 992 Carrera S I’ll be jumping in the passenger seat of will be heading out of the city to the mountain roads around San Francisco. This part of the US is used due to the sizeable elevation changes it offers, the predictable climate and, in Alex Ernst’s words: “The aggressive local driving.” That relates specifically to the abrupt stop-start traffic, the on-off-on the throttle nature of freeway driving and the terrible, combed concrete surfaces on those freeways. That Porsche sells a considerable number of its annual production in California is no bad thing, either. Ernst is very familiar with all of it; being the team leader of testing he’s been involved in every 911 since the 996. Joining his usual team of engineers today will be Matthias Hofstetter, director, powertrain product lines 911/718; Andreas Pröbstle, project manager, complete vehicle model lines 718/911, and ‘Mr 911’ himself, August Achleitner, vice president, product lines 911/718. And Total 911, of course. be the same width as the outgoing 991 GTS. They’ll be some 5mm higher, and 20mm longer at the front – the latter for styling purposes. The rear track will match the GTS, though Porsche has upped the front track by 40mm. That change, says Achleitner, “allows us to transmit more loading forces without a stiffer stabiliser. It enables us to lower the stiffness of the roll bar on the rear axle to transmit higher forces for accelerating out of a curve.” Filling the rear wheel arches in the Carrera S will be a 21-inch wheel with 305/30/ZR21 tyres, the front axle getting 20-inch alloys wearing 245/30 section rubber, the 992 being the first series Carrera to wear staggered wheel sizes. The body is lighter, too, Porsche using aluminium for the panel that begins at the A-pillar and runs over to the rear, it previously being steel, the doors and front wing being made of aluminium, too. For the full exposé on Porsche’s all-new 911, get your copy of Total 911 issue 172 in shops now, or click here for delivery to your door. You can also download the digital issue to any Apple or Android device of your choice.